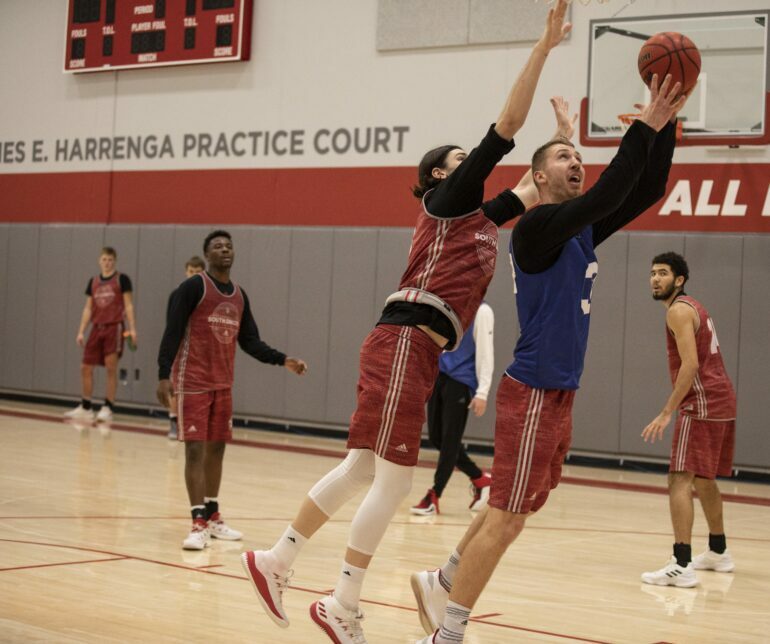 In preseason practice, senior forward Tyler Hagedorn suffered a high-grade medial plantar fascia tear that sidelined him for the 2018-19 season. Hagedorn has taken a redshirt for this season, giving him one more year of eligibility. Hagedorn is working down the long road to recovery that included PRP injections, two weeks in a scooter, boots for four weeks and weeks of rehabilitation. Hagedorn currently has a custom foot orthoses. He said he is perfectly healed, and getting his body conditioning back to its playing state is his current focus. Junior point guard Triston Simpson believes the team has been missing Hagedorn’s presence under the basket most of all. “Before the injury, he was going to be our starting five-man and really going to help us on both sides of the floor,” he said. “He is really gifted offensively. He has got a lot of confidence in himself. It shows when he plays, and even defensively he would help us out because we are really undersized right now. You know, he is 6-foot-10, and he could probably help us with guarding and opposing,” Simpson said. Simpson said the team had always given their support to Hagedorn, right from the start. “When the injury initially happened, you know the guys we are always going to be there for someone who is injured, being injured is tough especially when you are preparing for your senior year,” Simpson said. The Coyotes have suffered six conference losses this season. Injuries and lack of size have been major contributions to the struggle. Head coach Todd Lee said he felt the absence of Hagedorn this year. Hagedorn has been on the bench this season, which he said is difficult, but motivates him to continue preparing for next year. “It’s hard to watch, and be on the bench, because I know that I could be helping,” Hagedorn said. “It does give me motivation that next year I will be able to help the guys have a great season,” he added. The Coyote senior encourages his teammates, staying positive in the situation. Lee praises Hagedorn’s leadership qualities on and off the field. Simpson hopes the team finds success soon and says Hagedorn continues to play a vital role in court practices. “Obviously his role has changed a lot, but he is still really important and vital to our team, and our team’s success that we are hoping to get very soon,” he said. “He gives it to us in practice and he is trying to make sure that we are prepared and ready to go for whoever we are playing,” Simpson said. Hagedorn said he hopes to continue to improve as a basketball player and help lead the team to the NCAA tournament before playing professional basketball after the season. “My goals personally are to be the Summit League Player of the Year. Have a big time season win, conference regular season title, Summit league tournament title, and go to the NCAA Championships,” Hagedorn said.